Singapore doesn’t suit Mercedes’ car apparently. 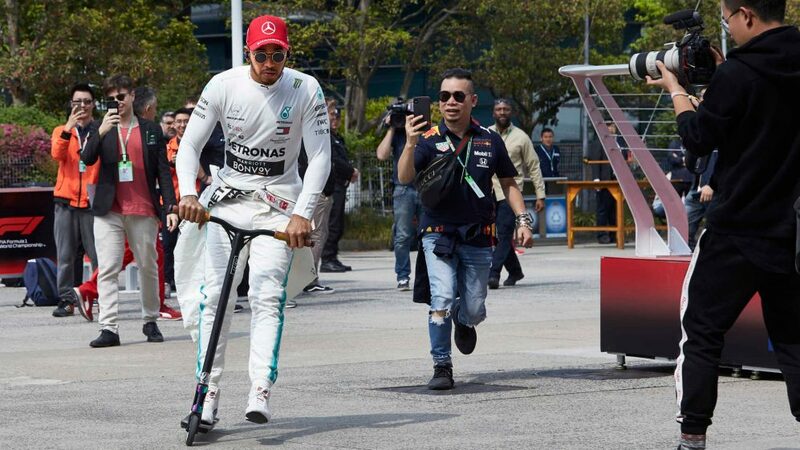 Well someone should have told Lewis Hamilton that, as the British driver romped to pole position in Marina Bay, a full three-tenths up on the Red Bull of Max Verstappen. Hamilton called it 'magic'. Mercedes chief Toto Wolff 'stardust'. In what was surely one of the laps of Hamilton’s career, he went around the 5.063km track in 1m 36.015s, over three seconds up on Sebastian Vettel's pole time from 2017. Wolff added that it had been the most epic lap around Singapore that he could recall. Vettel, Hamilton’s chief title rival, was visibly disappointed to only manage third, with Hamilton taking a huge psychological advantage into Sunday’s race with Verstappen as a buffer to the Ferrari. 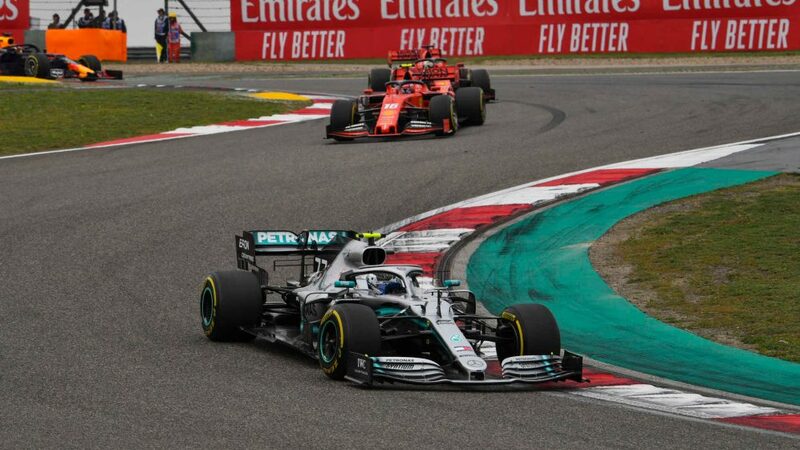 The Briton's team mate Valtteri Bottas couldn’t match the front-running pace, ending up 0.687s off in P4, ahead of the Ferrari of Italian Grand Prix polesitter Kimi Raikkonen and the second Red Bull of Daniel Ricciardo. 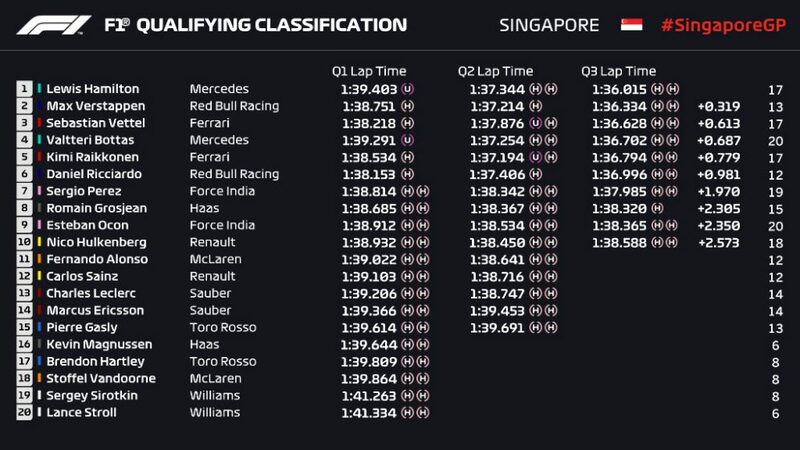 It’s tightly poised in the midfield, but after some initial struggles Force India won the battle with Sergio Perez taking P7 - his first ever top 10 grid slot in Singapore - ahead of the Haas of Romain Grosjean, the second Force India of Esteban Ocon and Nico Hulkenberg’s Renault. Mercedes rolled the dice in the first segment of qualifying, sending both Bottas and Hamilton out on the slower ultrasoft tyres as everyone else bolted on the faster hypersofts. 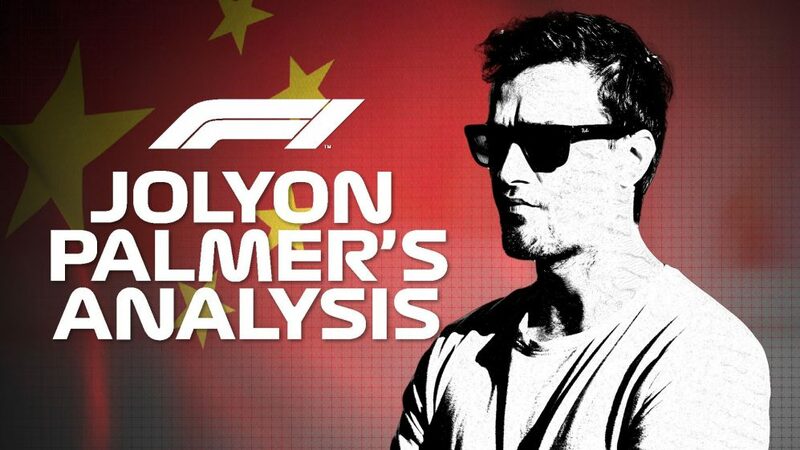 The team came within a whisker of disaster as the track rubbered in and the times started tumbling towards the end of the first 18 minutes of qualifying, with Hamilton ending up just two places off the drop-zone in P14, with Bottas in P12. 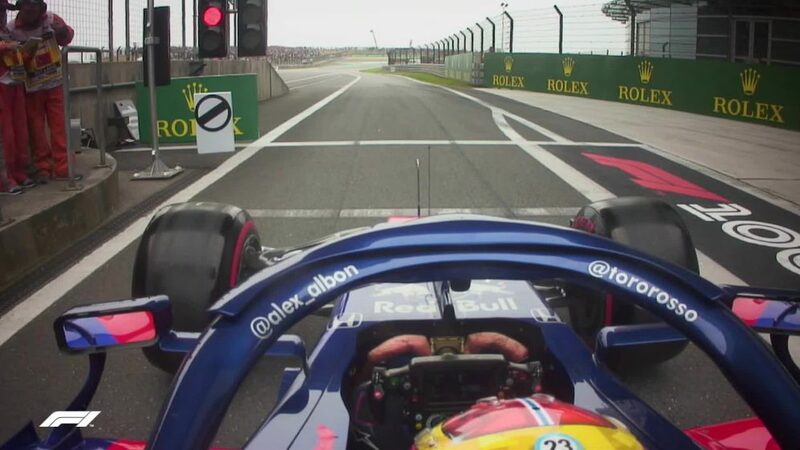 Up at the front, Red Bull would have been relieved, after a difficult Free Practice 3 that saw them over a second off the pace, to see Ricciardo’s name at the top of the timesheet, ahead of the Ferraris of Vettel and Raikkonen, while Verstappen was fifth. Force India managed sixth and seventh with Sergio Perez and Esteban Ocon, while Renault and McLaren also had skin in the top 10, Nico Hulkenberg eighth, Fernando Alonso ninth and Carlos Sainz tenth. Out in the first segment went Haas’ Kevin Magnussen – a shock, given that his team mate Romain Grosjean wound up a stunning P4 – with the Dane joined by the Toro Rosso of Brendon Hartley, the McLaren of Stoffel Vandoorne and the two Williams of Sergey Sirotkin and Lance Stroll – the cars in white an agonising three seconds off the ultimate pace. Ferrari took a leaf out of Mercedes’ playbook and sent both their drivers out in Q2 wearing the purple-walled ultrasofts. But with Raikkonen radioing in that the rubber was “way too slow”, the Scuderia called off the experiment and duly brought the Finn and Vettel back for hypersofts. They’ll have been glad they did, for although they played with fire leaving their drivers with it all to do in the latter moments of the segment, Raikkonen ended up going fastest, ahead of Verstappen and the two Mercedes of Bottas and Hamilton, with Ricciardo and Vettel fifth and sixth. Perez headed the midfield, securing his place in Q3 along with Grosjean, Hulkenberg and Ocon. 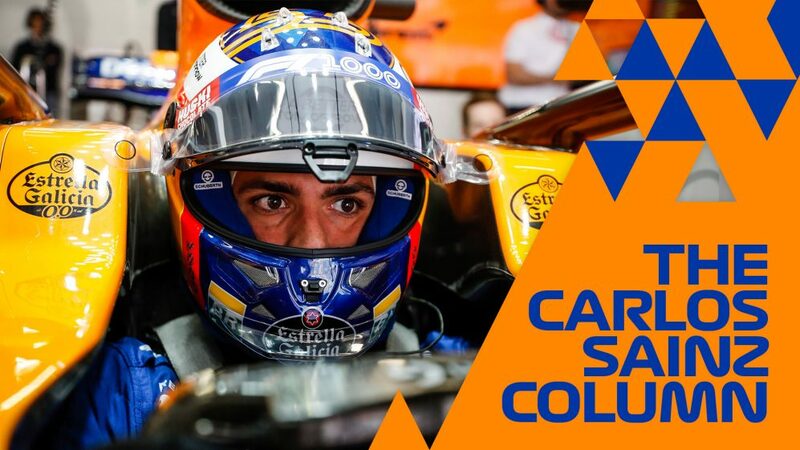 The two main casualties of Q2 were Fernando Alonso and Carlos Sainz in 11th and 12th, with both drivers having looked confident around the Singapore streets throughout the weekend. There was an edgy moment for Charles Leclerc in his first ever Singapore qualifying, as he clattered the side of his Sauber C37 into the wall at Turn 21. Having ripped off the front-right corner of his car in FP1 yesterday, his future employers at Ferrari will have been gladdened to see that the Monegasque hadn’t been cowed by his experience, even if his driving was still a little ragged. He carried on to end up P13, one place ahead of team mate Marcus Ericsson, with Toro Rosso’s Pierre Gasly in 15th. But there were still seven minutes to go. The cars wound their way back to the garage, the drivers had a re-think, and then headed out for another go. How could Ricciardo, Vettel, Raikkonen and Verstappen respond in cars that, on paper, were better tailored to the Singapore track? In the event, neither Verstappen nor Vettel improved on their own first tries, ending up P2 and P3. “We had two laps and they were both not good enough,” was Vettel’s verdict at the session end, while a delighted Verstappen said that his second place, felt “like a victory”, calling his quali lap the best he’d ever done. Raikkonen, fresh from a pole in Monza, put in a rapid first sector, before his lap petered out, the Finn winding up fifth, while Q1 leader Ricciardo could only go sixth, nearly a second off Hamilton’s pace. Having been slightly underwhelming yesterday as they tried to dial in their cars’ updates, Force India and Sergio Perez ended up best of the rest by a comfortable margin of over three-tenths to Haas’ Romain Grosjean, while Renault, who had been tipped to head the midfield coming into the weekend, could only manage a best of P10 in the hands of Nico Hulkenberg. Lewis Hamilton’s pole time may have been over three seconds quicker than last year’s pole lap, but it was a full 11.9 seconds faster than his 2009 pole. It was also the 200th pole position for an English driver. Bad point for Sebastian Vettel: Only five of his 52 victories have come after starting off the front row. Good point for Sebastian Vettel: One of those five was Singapore 2012 – when he started from third. Daniel Ricciardo has now been out-qualified by Max Verstappen in the last nine Grands Prix. Sergio Perez has scored in all seven of the Singapore Grands Prix he’s competed in – but this is the first time he’s ever qualified in the top 10 here. Charles Leclerc may be freshly-signed at Ferrari for next year – but the Monegasque is now on a streak of four races without a Q3 appearance. Stoffel Vandoorne has now been out-qualified by Fernando Alonso for the last 20 races. Romain Grosjean has given Haas their first ever top 10 start in Singapore. 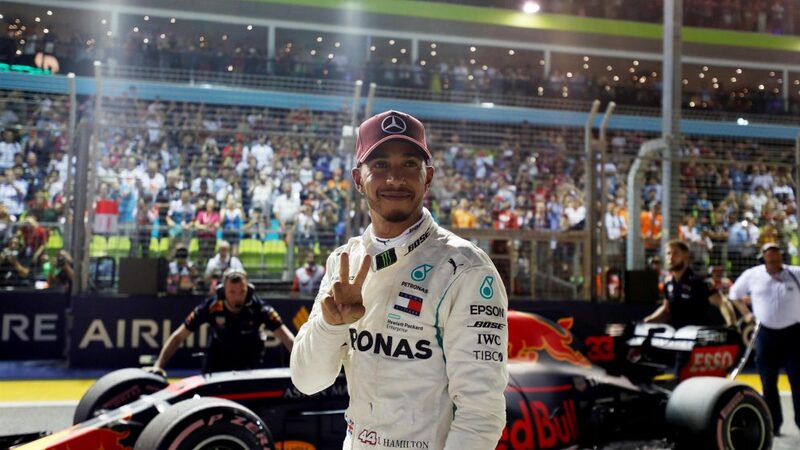 The driver on pole has won seven of the last nine Singapore Grands Prix. 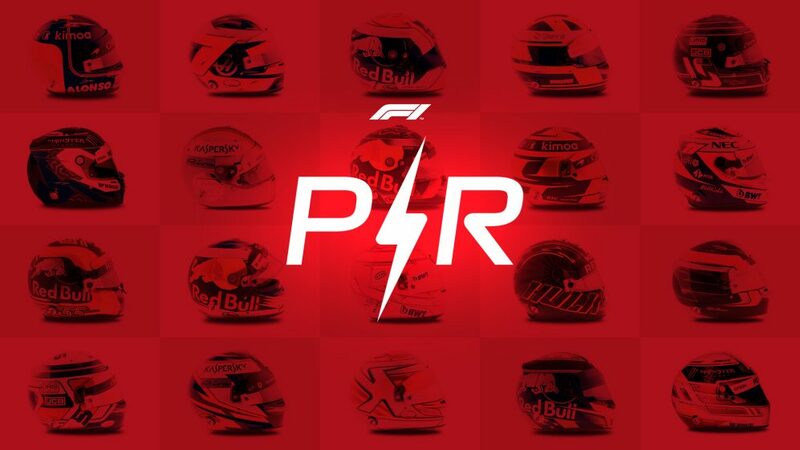 Kimi Raikkonen’s P5 means the Finn maintains his record of starting on the front three rows for every race this season. The racing will kick off under Marina Bay's floodlights at 2010 local time on Sunday, 1210 UTC, with conditions forecast to be not unlike those seen in qualifying - dry, with a temperature high of around 30 degrees Celsius.